Regardless of whether your cat has an obvious wound or is simply behaving more lethargic or more frail than usual, it is always important to bring him or her to a professional veterinarian where health and proper treatment can be ensured. 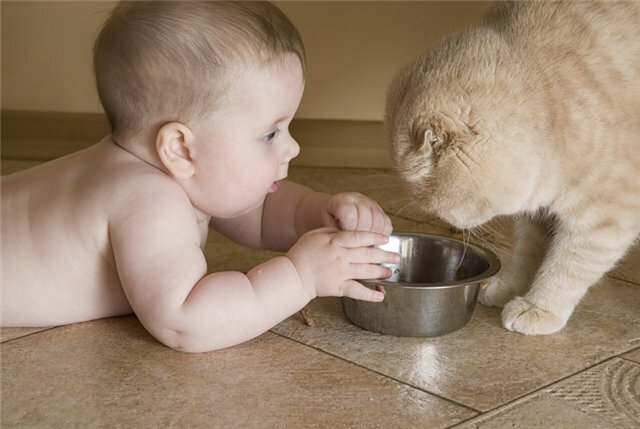 This is particularly the case if your cat appears to be in any stress or pain, if he or she has lost an appetite or completely stopped eating, and/or if your cat is vomiting (as they can dehydrate rather quickly). Unfortunately, seeing a veterinarian is, for some, not always a possibility. If your cat wanders home with an open cut at three in the morning or you simply cannot afford the expense of a vet office visit, here are some things you can do to help your furry feline friend. The proceeding steps should be taken to care for your cat’s cut or wound. It is important, however, to be careful and ensure your own safety first. Even the friendliest cats may unintentionally lash out with teeth or claws due to their own pain and discomfort. It is always helpful to have an extra set of helping hands, so one person can hold the pet as the other tends to the wound (it is best to hold your cat either by the scruff of the neck or with a towel over him, only exposing the wound. In some cases he or she may just be able to be held on your lap). If your well-being is at risk, simply bring your cat to the veterinarian where proper sedation or an anaesthetic may be used if necessary. Some pet’s cuts may run much deeper and may be much more painful than they appear on the surface skin. Should you get scratched or bitten, allow yourself to bleed out somewhat and rinse out the area with cold water and hibitane or an antibacterial wash. Seek the advice of a physician if you are at all concerned, as cat bites and scratches can swell considerably and may become infected. 1. Please put on medical gloves. 2. The first step in caring for your cat’s wound involves assessing the depth and size of the injury. If the cut is bleeding, largely open, or should the skin be partially flapped over, a pressure bandage needs to be applied (even a towel can be used, but apply a fair amount of pressure). This will need to be done for 2-5 minutes, or until all bleeding has ceased. 3. Once the wound appears fairly dry, it is important not to allow a scab to form without first cleansing the area (an infection can form underneath). If one has begun to form already, soaking the area with warm water and hydrogen peroxide will help dissolve it. Gently, the dried skin and scabs can be peeled off. This area may be painful to your cat, so please soak the area first and take the scabs off slowly. If the wound has been there for several days already, do not attempt to take the scab off as the healing process has already begun. Simply keep the area clean. If it seems infected, a veterinary visit may be necessary. 4. Gently trimming some of the fur surrounding the wounded area can make it easier for cleaning, as well as it can help keep the area free from unnecessary dirt or infection. Using a grooming set of clippers is easiest, otherwise use a small pair of first aid scissors. 5. After the cut has been dried and the scabs have been removed, generously rinse the area with a mixture of water and hibitane solution. This is done easiest by using a needle-free syringe, with which the wound can be directly cleansed and thoroughly rinsed. Do so a number of times. 6. If your cat’s cut is fairly large, or if it had been bleeding quite profusely, it is best to keep a bandage on the area for a couple of days. You may also bandage it with vet wrap, although this step is unnecessary if the wound is quite small or narrow. 7. Cleaning the wound and removing any scabs that form will need to be continued every 12 hours for at least three to four days. Be sure to always apply a fresh bandage at each time, and use a water and hibitane rinse. Hydrogen peroxide can also be used. After the first 48 to 72 hours, the wound can be left uncovered. 8. Whenever your pet is feeling unwell or is injured, be sure to keep them indoors. Moreover, if the wounded area does not seem to be healing or if it continues to bleed or becomes infected, please see a veterinarian. Often antibiotics are required for faster and trouble-free healing. The majority of cat wounds occur in outdoor cats, or to cats who live in a multi-cat home. They are usually the result of a scratch or bite from another animal (i.e. another cat, squirrel, mole, dog, coyote, etc.). Although some fights may result in an open wound, most are probably not even noticeable from the owner’s point of view «» at least not right away. Often bites from smaller animals, such as from other cats, only puncture the skin’s surface and do not cause a tear. Consequently, the small punctures atop the skin quickly close over and an abscess may form underneath. Abscesses are much more common, and are a little different from a regular cut in that they first form under the cat’s skin (known as cellulites). The first signs in a cat with an abscess tend to be more symptomatic and less obvious. While they may have pain or tenderness in a certain area, there is no obvious wound. Loss of appetite, loss of weight, lethargy, fever, and malaise are primarily evident. Eventually, however, a lump or external abscess will form, containing pus and inflammatory fluids. If left long enough the abscess will burst, releasing the pus and then will finally allow the skin to heal over. 1. Please put on the medical gloves. 2 If you know where your cat has been clawed or bitten, begin by removing some of the fur in that area, either by using a clipper or a small pair of scissors. Just be careful, as this area may be sensitive to your cat’s sense of touch. Abscesses are often more painful than a regular cut, as they are inflamed below the skin’s surface. 3. If there is a scab that has formed, gently soak it with warm water and hydrogen peroxide. Pick off as much residue as your cat will allow. 4. Once any scabs have been removed, or should you see a small opening, gently squeeze the area. Be certain not to force the abscess open, gentle pressure should be enough. If some liquid and pus does come out, try to squeeze out as much as possible. This will actually relieve the pressure on your cat, and make him or her feel less pain. 5. Once the area has drained, rinse it out with a combination of water and hibitane solution, using a needle-less syringe. Do so numerous times and ensure all the pus has been removed. Hydrogen peroxide can also be applied to the surrounding area. 6. The area will need to be rinsed and cleansed every 12 hours for three to four days. Should any scabs form they will need to be soaked off each day with warm water (at least until the fourth day, then allow natural healing). Avoid placing a bandage, but allow the abscessed area to breathe openly. 7. If you are unable to squeeze the abscess open, it is best to consult a veterinarian. Forcing the area open may be unnecessary and may cause more damage than good. Eventually the skin above the abscess may burst itself (in which case follow through steps 1, 2, 4, and 5) and/or may turn black and crusty. At this point the dead skin can be picked off and should cause no pain to your cat. 8. Abscesses are infectious and often require antibiotics, so at some point a veterinary visit should be scheduled. A drain may also need to be put in place by your vet to remove any excess inflammatory fluids or pus. It is, thus, important to remember that a cat wound and an abscess are in a sense two different injuries (one above and one below the skin’s surface). Many cats may attempt to cleanse themselves and lick these such areas. To an extent this is acceptable, as long as they do not overdo it «» too much licking can cause more irritation than good. It is also worth noting that illnesses, such as feline leukemia and feline immunodeficiency virus can easily be transmitted during cat fights. Speak to your veterinarian regarding the chance of such an occurrence, particularly if your cat’s vaccinations are not up to date.